According to the US Census Bureau, the number of Spanish speakers in the US has more than doubled since 1990 and the number of people aged five and older who now speak Spanish at home as their first language now totals almost 37 million. When we take into account the number of people who speak Spanish as a second language, the total rises to 45 million, and a further 6 million are said to be learning Spanish in the US today. Given this staggering rate of growth, it’s thought that by the year 2050 the number of Spanish speakers in the US could rise to as many as 100 million. The language first came into the country in the 16th and 17th centuries with the arrival of Spanish colonists who set out to explore the areas which have become the modern day states of Florida, California, Arizona, Texas, New Mexico, Utah, Nevada and Colorado. The Spanish-speaking population has been further boosted by the influx of Hispanic immigrants which began in the latter half of the 19th century and continues to this day. Though Spanish does not yet enjoy official status, it is by far the second most widely-spoken language in the US after English, and Spanish speakers outnumber all of the Chinese, Italian, French, German, Hawaiian and Native American speakers put together. 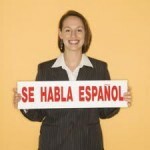 If you want to keep pace with the exponential growth of the Spanish language in the powerful US economy, try our Private Spanish Lessons with native tutors at your home or office throughout the London area.